(Nanowerk News) A team of scientists from ITMO University and Trinity College Dublin published first experimental results showing that ordinary nanocrystals possess intrinsic chirality and can be produced under normal conditions as a half-and-half mixture of mirror images of each other. The discovery of this fundamental property in nanocrystals opens new horizons in nano- and bio-technology and medicine, for instance, for such applications as targeted drug delivery. The results of the study were published in Nano Letters ("Intrinsic Chirality of CdSe/ZnS Quantum Dots and Quantum Rods"). Ever since the development of artificial nanocrystals, scientists thought that chirality -- the property of an object to be non-superimposable with its mirror image -- was either random or completely absent in nanocrystals. 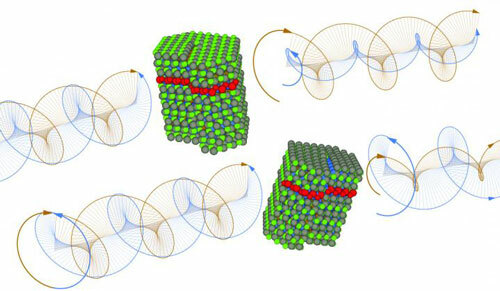 A joint experiment conducted by researchers from Optics of Quantum Nanostructures laboratory at ITMO University and Centre for Research on Adaptive Nanostructures and Nanodevices (CRANN) at Trinity College has demonstrated that standard nanocrystals (cadmium selenide quantum dots and quantum rods), in fact, make up a racemic (50:50) mixture of 'right' and 'left' chiral forms. Until now, chiral nanocrystals could only be achieved artificially by attaching special chiral ligand molecules to the surface of nanocrystals. Chirality is intrinsic to many objects of the natural world, starting from elementary particles to spiral galaxies. Our body, as well as many other complex biological objects, is almost entirely made of chiral biomolecules. Importantly, the biological activity of 'right' and 'left' forms of the same compound might differ dramatically. Often only one chiral form is edible or has the required therapeutic effect, while its antipode will be at best useless. For example, molecules of a well-known painkiller ibuprofen have two optical mirror isomers. One of them indeed helps relieve pain, while the other not only does not relieve pain, but is toxic for the organism. A key indicator of chiral environment is called optical activity: depending on the chiral form of a nanocrystal, it can rotate the plane of polarized light either to the right or to the left. A normal solution of nanocrystals by definition does not reveal any optical activity, which was always attributed to the apparent inexistence of chirality in nanocrystals. Having divided 'left' and 'right' forms of nanocrystals, scientists from ITMO University and Trinity College managed to prove the opposite. To separate different chiral forms of nanocrystals and capture the manifestation of their intrinsic chirality, the scientists came up with a technique that, according to the group, can be potentially expanded and used with many other inorganic nanomaterials. The researchers immersed nanocrystals in a two-phase unmixable solution of water and organic solvent (chloroform). As nanocrystals are not soluble in water, in order to transfer them from organic phase to water, scientists added L-cysteine, a chiral molecule frequently used as a ligand for such a phase transfer. Cysteine replaces hydrophobic ligands on the surface of nanocrystals making the latter water-soluble. As a result, regardless of the chiral form of cysteine, all nanocrystals without exception will end up in water. Researchers found that if they cool the solution and interrupt the phase transfer at a certain point, it is possible to achieve a situation, wherein the ensemble of nanocrystals is divided equally between the phases with 'left' and 'right' nanocrystals in different phases. Optical activity in nanocrystals separated in this way is preserved even after the subsequent removal of cysteine from the surface, which additionally testifies to the natural origin of intrinsic chirality in nanocrystals.